“Maverick Leadership: A maverick is one who doesn’t stay with the herd.” from Christian Faith Publishing author Marc Roth explains how he, and those who worked with him, become a leader within his business and transformed his business into an industry leader. “Maverick Leadership” demonstrates how someone can continually push boundaries by leading others to success. “Maverick Leadership: A maverick is one who doesn’t stay with the herd.”: a guide to becoming a business and industry leader. “Maverick Leadership: A maverick is one who doesn’t stay with the herd.” is the creation of published author, Marc Roth. Marc was put up for adoption at birth by a mother who did not want children. His father intervened. For the next twelve years, Marc and a sister were the weapons of war between their divorced parents. They spent most of their time being shuffled between parents, grandparents, and a foster home. At age eleven, the onset of a hereditary eye condition left Marc legally blind. Insecure in relationships, yet highly competitive, Marc devoted his time to overcoming his visual disability and excelling in all things. In high school, he was a two-sport letterman, honor student, and student organization leader who score very high on his college entrance exams. He earned both a BS and MS from a major university without accruing any debt. In addition to some scholarship aid, he worked all throughout college and had a wife who also worked full-time. Marc’s chosen field was the commercial cattle-feeding industry, which is a 24/7 type of enterprise where the task must be completed every day, no excuses. Throughout his forty-two years in the industry, Marc held positions in management as an owner and a consultant. He built and successfully managed the world’s largest feeding operation. His desire is to share the principles of leadership that enabled him to attract and develop the key team leaders every successful business requires as well as the operational philosophies that enable leaders to transform their businesses into class leaders rather. Marc was forced into retirement at the end of 2014 due to his continued vision loss. He and his wife live in the Flint Hills of Kansas where he remains active in his church and Gideons International. He still does a little consulting work. He is “Papa” to five grandkids. He may be contacted via email at rothspromax(at)hotmail.com. Published by Christian Faith Publishing, Marc Roth’s new book shares the principles needed to become a Maverick Leader. The term maverick, as used in the cattle industry, refers to an individual animal that does not feel the need to stay with the herd. “Maverick Leadership” describes the circumstances that led author Marc Roth to become highly independent and intensely competitive. Above all, it was his independence that enabled him to surround himself with a diverse array of skilled and ethical people, many of whom left his operation to become leaders in their own right. “Maverick Leadership” illuminates the operational principles that will allow businessmen and businesses to become industry leaders. “Maverick Leadership: A maverick is one who doesn’t stay with the herd” shows readers how to develop the culture of excellence and innovation required to maintain leadership in an industry. It also provides practical examples of how these principles have been implemented. It is about finding the balance between challenging the existing norms and maintaining the existing norms at the highest standard possible. It also requires leaders to bring high-potential people into an operation, making them both responsible and accountable for specific parts of the process. Leaders must limit the opportunity of their team members to fail, accept blame if it happens, and celebrate their successes, rewarding them with increased responsibility. View a synopsis of “Maverick Leadership: A maverick is one who doesn’t stay with the herd.” on YouTube. 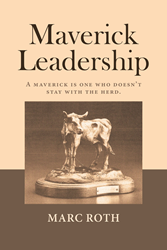 Consumers can purchase “Maverick Leadership: A maverick is one who doesn’t stay with the herd.” at traditional brick & mortar bookstores, or online at Amazon.com, Apple iTunes store, or Barnes and Noble. For additional information or inquiries about “Maverick Leadership: A maverick is one who doesn’t stay with the herd.”, contact the Christian Faith Publishing media department at 866-554-0919.